Up until my new job, I’ve reviewed every issue of All-New Wolverine to this point. After all, Laura is the character that got me into comics in the first place. But I missed reviewing the last two issues because I don’t have time to review more than one comic a week with my new job, and there have been a lot of major releases lately. With no major releases this week, I’m glad to get back to taking a deeper look at this series. 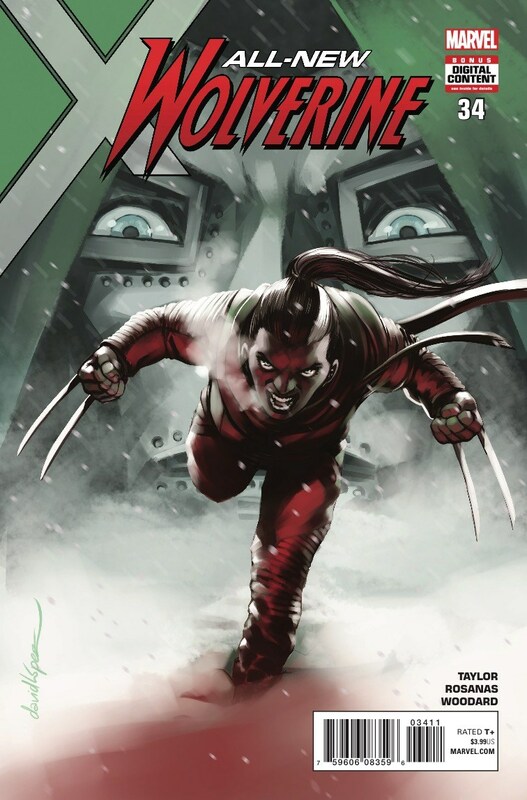 All-New Wolverine 34 is the second issue in the 3-part story, Old Woman Laura. It’s the second story arc in this series that’s taken its name from a classic Wolverine story. And like Enemy of the State II, there are a lot of differences between Logan’s version of the story and Laura’s. Old Man Logan took place in a post-apocalyptic world where the heroes were all but extinct, and Logan gave up on the hero life to try and raise a family, forever swearing off violence. Of course, things went very wrong anyway. In Old Woman Laura, the heroes have pretty much won. It’s the most well off alternate future I’ve ever see within the X-Men franchise. And to see an alternate future like this is a refreshing change from the dire futures we see all the time. Despite this, Laura is dying due to problems in her original cloning process. She’s decided to go on one last mission, with two purposes. One, to kill the last villain on Earth, Doctor Doom. Two, to save her clone sister, Bellona, who was arrested by SHIELD at the end of Enemy of the State II. She’s long since vanished in this alternate future. Written by Tom Taylor, this issue picks up where the last left off, with Laura arriving at the Latverian border, only to be joined by several allies who have worked with her over the course of this series (and Kelly Thompson’s recent Hawkeye run). Apart from Gabby clearly sounding more mature and Laura sounding a bit like her fatalistic younger self, due to dying, everyone feels pretty much the same as they normally do. The action is quick but fun, and the dialogue is amusing as usual for this series. The story itself is also pretty good. With that said, this issue doesn’t have the same kind of drama that made the rest of this series special. Even when one character apparently dies, you don’t feel it that much since in earlier issues, and even in this story, it’s made clear that Laura was never really fond of … nope, not spoiling who it is. Ramon Rosana’s art is great. It’s a simple look upon first glance, but there’s a fair amount of detail anyway. Although I’d prefer a couple more wrinkles on some of the characters present due to their age, they all look a bit older than they currently do yet they’re still perfectly recognizable. I like that Hawkeye features a couple scars on her arm, which are consistently drawn throughout the issue. Laura’s white streak of hair consistently comes from the same place. Background details include touches like cracks on the floors and walls on the streets, and a mix of classical architecture and buildings that look kind of like space colonies from the Mass Effect trilogy. Facial expressions do a great job at conveying emotions, like Hawkeye’s shocked look when she learns that Laura’s dying, while Captain Marvel’s look is more jaded. The coluring by series regular Nolan Woodard is also great. The comic is appropriately bright and colourful before they pass through the shield dome, and darker and more subdued on the inside. There’s great use of shadows, reflections and shading throughout that really enhances the clean look. While this isn’t as good as story arcs like Orphans of X or The Three Sisters, this feels like a good conclusion to Tom Taylor’s run. It touches on some of the character developments he’s sprinkled through the series, while also somewhat returning Laura to her darker past and celebrating her connections. While it would be nice to get a bit more background detail on this alternate future, and to make more room for character drama than we’ve got so far, Taylor’s only got 3 issues to tell this story. And he’s making good use of page space so far. I wouldn’t recommend this issue or story arc to anyone just jumping in on this series, but it’s worth picking up for those who have been enjoying All-New Wolverine from the start. This entry was posted in comic review, comics and tagged all-new wolverine, bellona, captain marvel, carol danvers, comic review, comics, doctor doom, gabby, hawkeye, kate bishop, laura kinney, marvel comics, marvel legacy, nolan woodard, old woman laura, ramon rosanas, tom taylor, wolverine, x-23. Bookmark the permalink. It’s a great issue. Lots of fun stuff. And I thought the death was actually really good, but I’ve never hated the character the way a lot of people do.